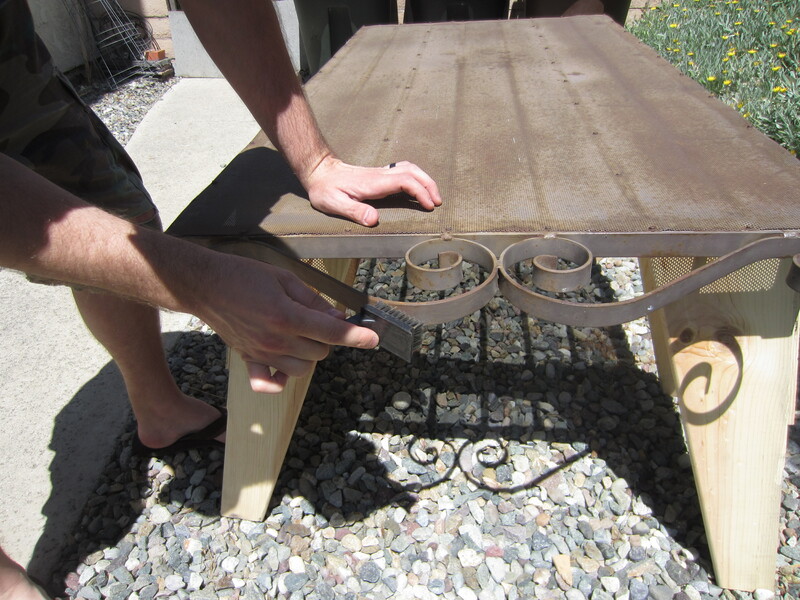 How to paint metal, a rusty metal gate makeover to boost curb appeal. 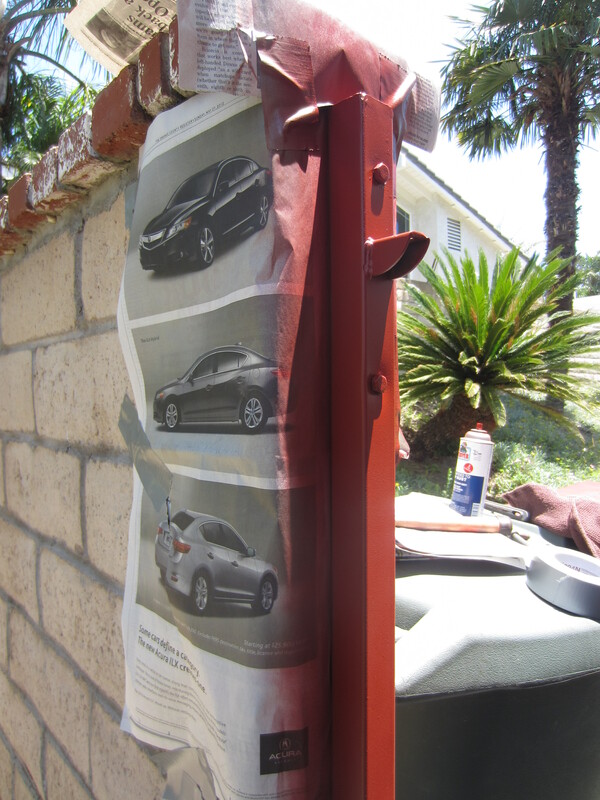 My husband and I decided to tackle the simple weekend DIY project, painting our metal side gate. It looked really worn and rusty and needed a little TLC. So needless to say we needed to figure out how to paint metal. It’s hard to believe that it is the same gate. Here is a BEFORE and AFTER photo. There’s a big difference, huh?? It looks like the photos are different sides but they are not. Same side, just much better! This project is simple and can be done over the weekend (due to drying time). It’s a simple and easy way to boost curb appeal. You can use these instructions for painting patio furniture and the like. Here is my tutorial on How to Paint Metal. Materials: This list has some recommended supplies from Amazon that are my affiliate links. We didn’t have a workbench so first, we disassembled the gate door and placed it atop of two wooden work horses. Next, using the wire brush, gently scrub off any rust or paint on the entire door both front and back. 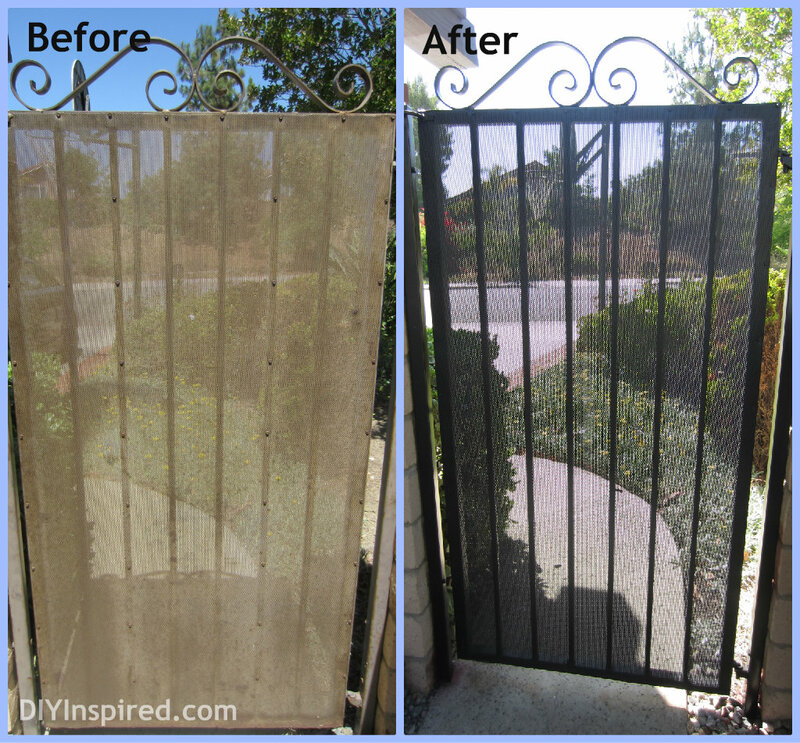 This is an important step because the rust removal alone can transform the appearance of the gate. Here is what it looks like after scrubbing. I would even recommend doing this step and stopping if your paint isn’t too bad! You can see the transformation already. 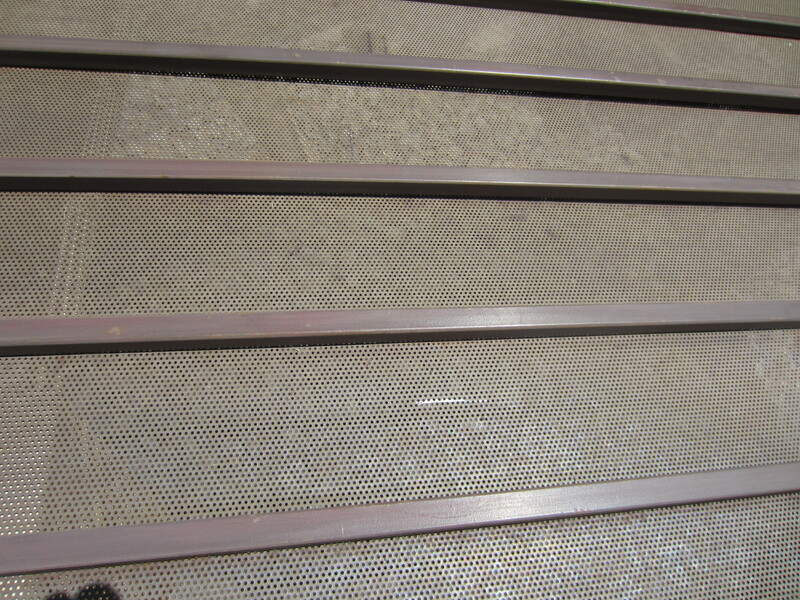 To remove the paint chips and rust debris, we hosed it off and let it air dry outside. 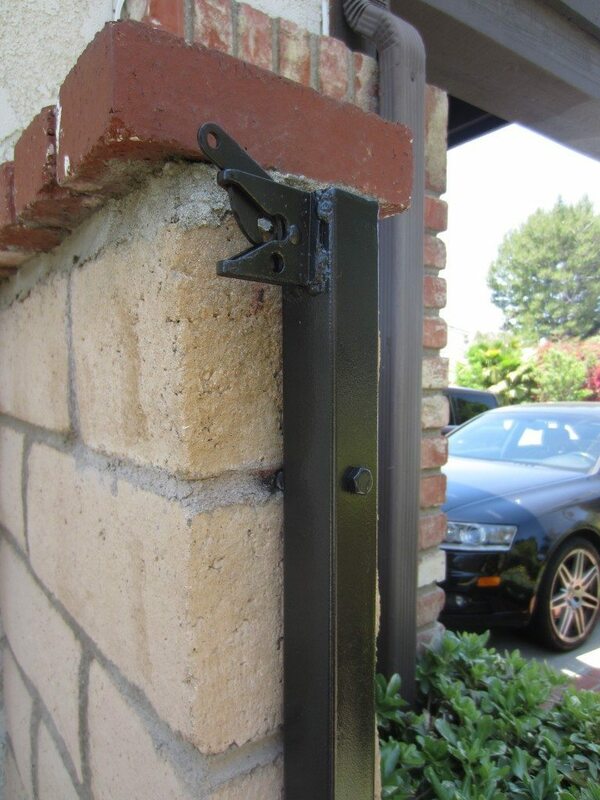 We found this to be the quickest and easiest way to remove debris from this type of gate. Next, use a primer for metal. We ran into a friendly handy man at Home Depot and he recommended Rust Destroyer. It is a red primer and stops rust all in one. We used almost two cans (two coats) for this entire gate. Follow the instructions on the can for drying times. Make sure you spray in a well-ventilated area. After using it, I would highly recommend it. Meanwhile, we used newspaper and tape to protect the wall and painted the metal gate supports (or whatever you call them…ha!). Finally, once the primer was dry, we painted the gate with two coats of spray paint made for outdoor metal. 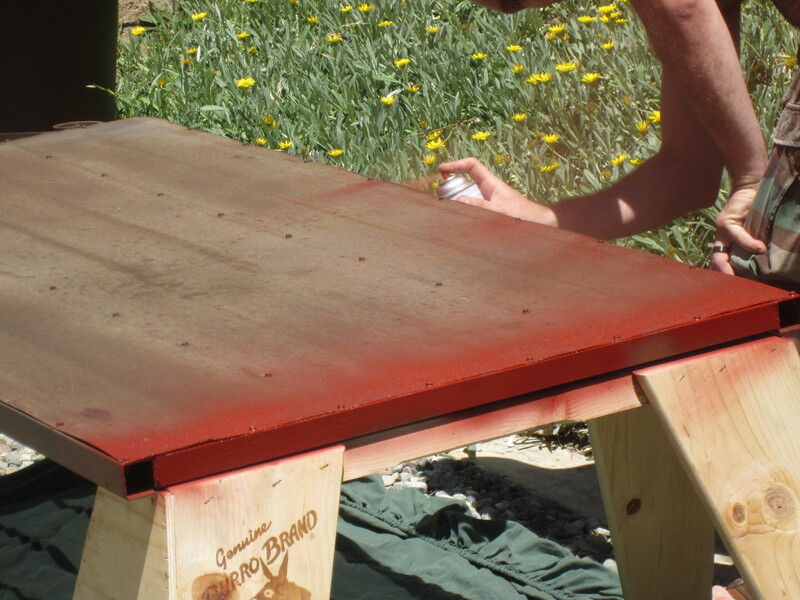 We used black hammered Rust-Oleum spray paint. Once it was dry, we re-assembled the gate. Ta da! Here is the before and after photo again! Update: I originally wrote this post on June 11, 2012. This was just after we moved into that house. We lived there for four years and the paint on this metal gate held up well and still looked good as new. WOW can’t believe its the same door! Amazing! It’s crazy isn’t it? Who knew! Great job !!!! What a difference–you both are really very handy !!!!!! Hi Mari! If you use smooth light strokes when spray painting, the holes will not get clogged. It’s best to do several light coats versus one or two heavy ones. I hope this helps!